Sue Storm/Richards is a hero in the Marvel Universe. She is considered to be the first female super hero created during Marvel's Silver Age. Speculation in Marvel forums hints at the Fantastic Four returning during Marvel Legacy. In the F4 Fox films Sue Richards has been played by actresses Jessica Alba and Kata Mara. With the Fantastic Four license shifting back to Marvel in the Disney Fox deal a new actress will be hired to play the Invisible Woman in the Marvel Cinematic Universe. Sue and her brother Johnny Storm have a rough childhood, primarily due to the premature death of their mother, Mary. Their father, Franklin Storm was a successful Doctor and surgeon. One fateful night their lives are torn to shambles. Sue parents were driving home from a party thrown in their father's honor. On the way home the couple has a car accident from a blown tire. Mary is badly injured in the accident and Franklin chooses to operate on her there rather than take her to a hospitable. Mary dies and Franklin forever blames himself for her death. Franklin falls a part after Mary's death and becomes a degenerate gambler and alcoholic. Falling deep into gambling debt he ends up killing a hostile loan-shark. Still riddled with guilt over his wife's death he finds himself unable to motivate himself to defend himself in trial and is sent to prison. Sue goes to live in a boarding house run by her Aunt. There she acts as the primary care taker for her younger brother Johnny. When she is (13 or 17) a young, eccentric genius moved into one of the rooms. Sue became infatuated with the 19 year old genius named Reed Richards. Reed is embarrassed by the younger girl's crush on him and quickly moves out. Sue never forgets about Reed and follows his progress from afar. Sue moves out to Hollywood to pursue an acting career. While their she stumbles upon a meeting with her old crush Reed Richards. Quickly the two begin dating and eventually are married. Sue becomes a partner in Reeds special project to launch a space craft to Mars. She convinces him to bring her along during the voyage. She also brings along her kid brother (I never understood this). During the mission they are exposed to cosmic rays which force them to return and make a crash landing on Earth. Once back each member of the crew realize they have their own special powers. Rather than hide their powers Reed Richards decides that they should become the world's first Super Hero team that is open with their identities. They call themselves the Fantastic Four and begin battling an array of super villains with their new found powers. Initially, Sue's power only allows her to turn invisible and she constantly finds herself captured by antagonists. She is captured multiple times by Doctor Doom and by Namor who both are infatuated with her. Time and time again the rest of the Fantastic Four come to her rescue. This changes when her powers are expanded to include force fields. When Sue gains the ability to create powerful force fields she becomes one of the more powerful members of the team. She is also seen as a co-leader of the team in part due the fact that the Thing is a hot head and her brother the Human Torch often acts immaturely. The new powerful Sue often comes to the rescue of the boys instead of the other way around. This new powerful Invisible Woman is how she has been shown in all modern adventures and in other media. The Invisible Woman arguable is the most powerful member of the Fantastic Four. 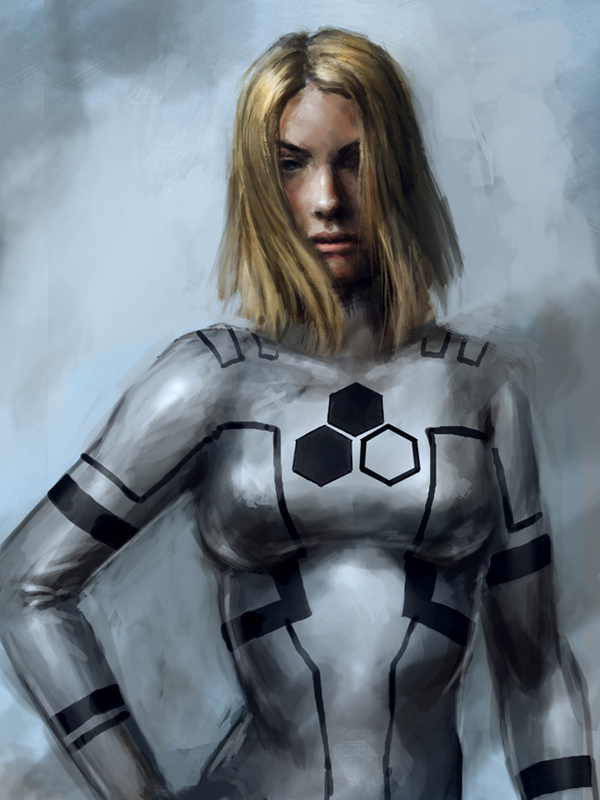 She can create powerful force fields that both protect her from attacks as well as render her or others invisible. She can use the force fields defensively to protect her from attacks or throw them like moving walls at attackers in an offensive fashion. Fox owns the movie rights to Fantastic Four so the movies do not exist within the MCU. However, it has been suggested that the 2015 film will exist in the same universe as the X-Men films. Jessica Alba played the Invisible Woman in two films the 2005 Fantastic Four and its sequel "The Rise of Silver Surfer". Kate Mara was the Invisible Woman in the Fantastic Four (2015) film.